Hercules is a remotely operated vehicle (ROV) and Bob Knott is the man charged with making its video feeds available to the world. Of course you know what outer space is . Inner space? That’s the ocean depths. 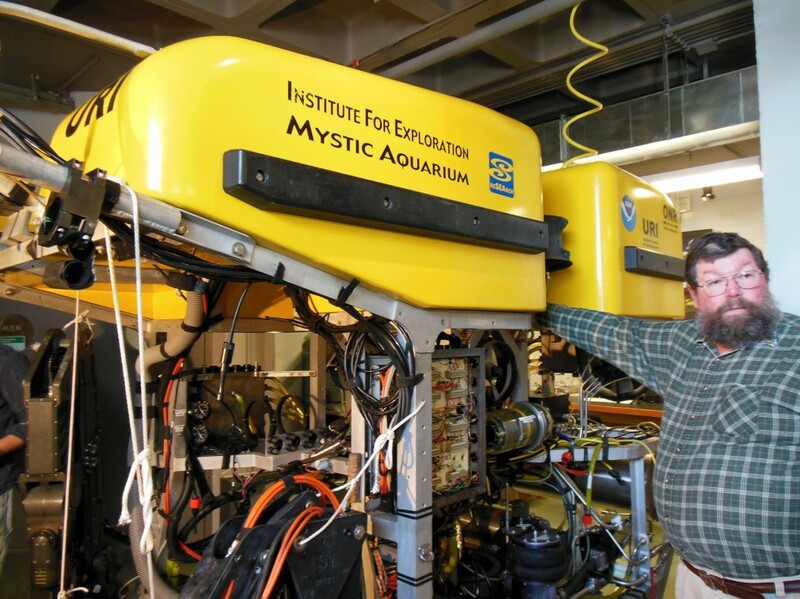 It is also a division of the University of Rhode Island Graduate School of Oceanography. The graduate school is located on beautiful Narragansett Bay in Rhode Island. One division of the school is the Inner Space Center. I had been there in the past while escorting busloads of my high school students who were participating in the Jason Project. They actually got to watch live undersea exploration through the lenses of research vehicles that were thousands of feet below the surface of the ocean. The highlight of the presentation was always when a lucky student was selected to actually steer the undersea vehicle from thousands of miles away. 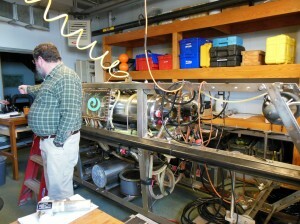 We were in Rhode Island while the submarine research vehicle could be anywhere – the Mediterranean, South Pacific, etc. A short while ago a ham radio friend of mine, Jim Gershman (K1JJJ) invited me and two other ham friends (Art Daniels / K1GTI and Jim Hopkins / K1VFM) for a personal tour of the URI Inner Space Center. He was able to make the offer because he is a friend of Bob Knott (K1RWK), the Senior Broadcast Engineer for the Inner Space Center (ISC). Needless to say we all readily accepted the invitation. We arrived on a cold January day and found Bob in his office working on an upcoming project. He is provided with the general outline for a future production that will usually require all sorts of technology and capabilities that are as yet untested and possibly not available in finished form. He then searches for what he needs, contracts to purchase what he can and develops/builds whatever is necessary to create a stunning video and audio presentation. The presentations put on by the ISC involve the coordination of numerous live video and audio feeds over thousands of miles. The origin for most of the productions can easily be over a mile below the ocean surface. You may have heard of Dr. Bob Ballard and his ocean research that has led to numerous archeological and biological discoveries throughout the world. 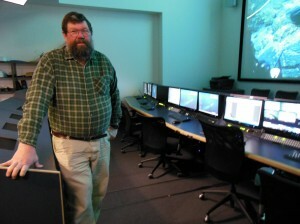 Bob Knott is the man back at the base camp who makes sure the research scientists (they have special access from all over the world), students, and general public can benefit from live and recorded HD video and audio of the undersea environment. 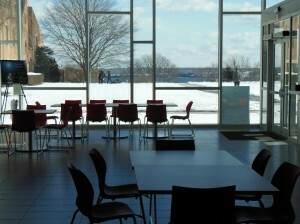 Our tour started at the Nautilus Galley, a really bright and welcoming lunch area with an amazing view of the URI Oceanography School campus and Narragansett bay. From there we moved on to the Mission Control area. This is where the public and students get to see the live video (there is actually a short delay) sent from below the sea. While we were there the numerous high-definition screens were displaying recorded video of past missions. It was difficult to stop watching – the clarity of the images and the sense of discovery they convey are overwhelming. Bob patiently answered all our questions about how everything worked. 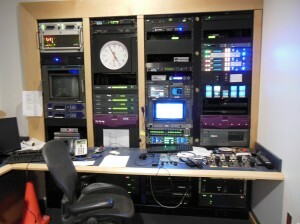 We also checked out an adjacent broadcast studio and nearby audio mixing room. Finally Bob showed us where all the computer engines are located (wires, wires everywhere with special ceiling and floor access) and what I think is his favorite spot, the Broadcast Hub. 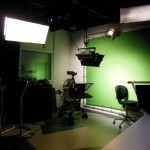 The broadcast hub is where the real behind the scenes audio and video coordination is performed. Although I didn’t mention it at the time, I couldn’t but help noticing how much the hub looked like a really great ham radio station. All those nice built-ins, the international clock, computer racks, waterfall display, wraparound desk … maybe Bob could convince someone that they really need an HF station installed as a communications backup? Our final destination for the day was the maintenance shop. This was no ordinary maintenance shop, though. This is the place where the ROV’s go when they are not out to sea. Approximately every six months they come back home for a partial teardown. Just one item that needs to be checked is the electronics. This plate has been removed for servicing of the electronics that it covers. The cavity below it would be filled with oil when in use. 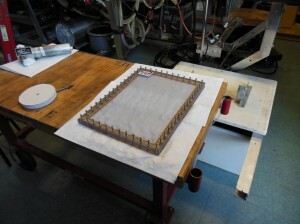 Each electronic panel is covered with a thick pressure resistant Plexiglass panel. As thick as these panels are, they will still crush under the many atmospheres of force under the ocean unless there is something behind them, oil. Each covered electronics panel is filled with oil. It can be quickly checked for the presence of any water by draining off a sample. The day we toured the shop it was occupied by three vehicles: Argus, Hercules, and a kayak drone. Argus keeps an eye on Hercules. It is held by tether at a constant depth and has controls for side balance only. 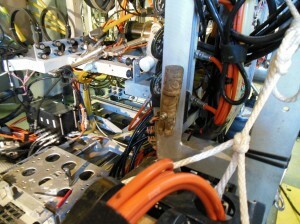 Closeup of the front frame of Hercules and the onboard talisman. Argus is a large sled that carries special lighting equipment. It is held at about the same level underwater as Hercules, the primary exploration vehicle, and supplies lighting for the work area. It also allows the crew at the surface to keep an eye on Hercules so they know how to direct its movement. Argus has a nice big weight as ballast, about 2,500 pounds of ballast if I remember correctly. It’s frame structure is made of stainless steel. Hercules is the actual worker. It collects samples and provides most of the HD video that everyone is so interested in. If you look at the photograph carefully (at beginning of this story) you will see the locations for various cameras and lights. The frame on Hercules is made of titanium. If you look real closely you may notice that while Hercules is way down at the bottom of the ocean it carries with it a small tiki. Look for it in the photo to the left. The other vessel we observed was what at first appeared to be a standard 12 foot Pungo kayak. Upon closer inspection though it was evident that its hatches were way better sealed than would be on a factory kayak. Even the entire cockpit had a tight-fitting and watertight seal. There are also antennas, a large red kill switch, etc. You get the picture. 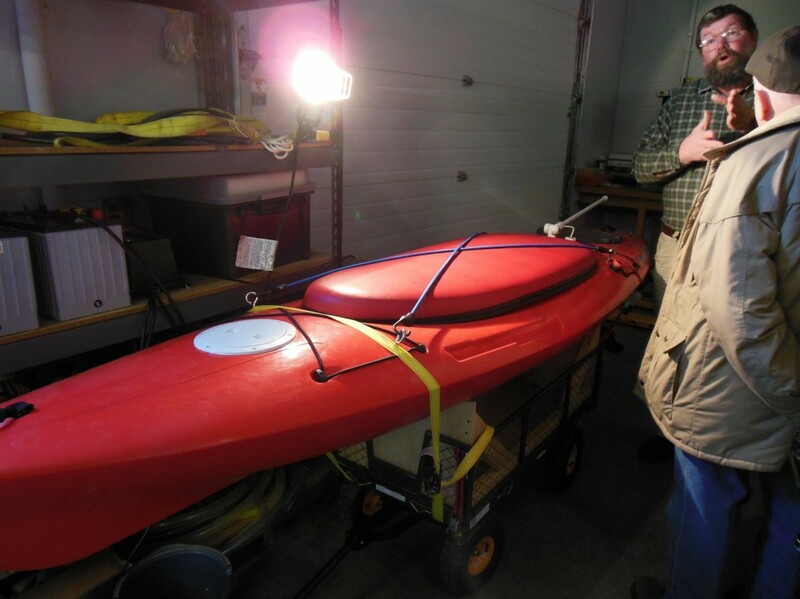 This not so ordinary kayak is outfitted with special equipment that can report back about weather conditions. It can be programmed to sail a large ocean grid and thereby provide realtime data from wherever it is directed to go. It also has advanced avoidance capabilities so it will not collide with any other boats that it may encounter. This neat device is cutting edge and is still in development (as in not yet given approval). I like to call it the kayak drone. I would like to say thanks to Bob for the great tour! If you would like to get a tour I am told that there are regularly scheduled ones available once a month. Check out the website for additional information. You will surely enjoy the time well spent. This entry was posted in Occasional Commentary and tagged Argus, Ballard, Bob, exploration, Hercules, Inner, Knott, Oceanography, RI, ROV, Space, undersea, URI. Bookmark the permalink. Very nice article Ken, I enjoyed reading it. Thanks, Lee. It was a fun visit. Bob was the perfect host.